Today we’re launching a new Realm mobile database, this time built specifically for Xamarin. It offers easy object persistence and full query capabilities, with a performance profile that’s faster than existing options. Like the other editions of Realm, it is designed from the ground up to enable reactive app development, with live objects, change events, and support for unidirectional data flows. Get Started with Realm Xamarin - or check out the source on GitHub. Realm is a database built from the ground up for the unique challenges of mobile app development, that runs directly inside phones, tablets or wearables. We launched for Java, Objective‑C, & Swift in 2014, and for React Native earlier in 2016. We are already used on hundreds of millions of devices today by appmakers including Twitter, Starbucks, Cisco, Walmart, Google, Amazon, & eBay, plus many many others. Today, we’re launching for Xamarin, Microsoft’s mobile framework that lets developers write C# code that becomes native iOS & Android apps. Realm Xamarin brings the modern design & simplicity you expect from Realm, and will allow you to target both iOS and Android with the same codebase. We currently support Xamarin.iOS and Xamarin.Android, and look forward to supporting Xamarin.Mac in the future, as well as UWP and Unity. 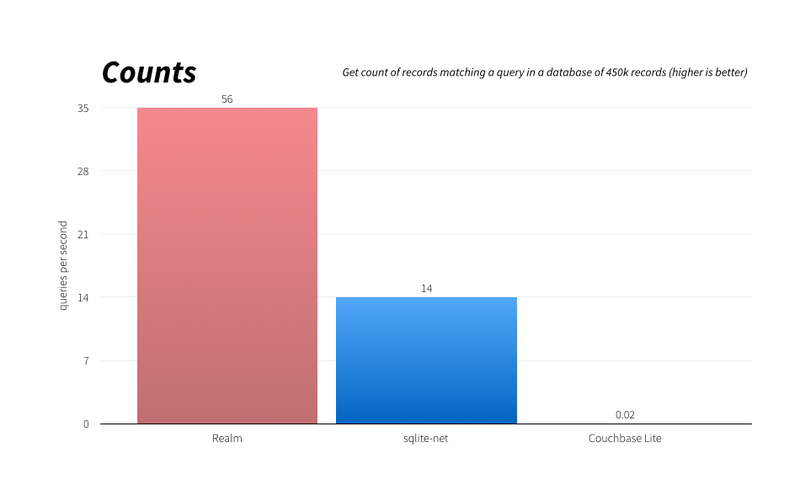 Realm is not an ORM, and is not built on top of SQLite. Instead we’ve built a full database for mobile app developers, one that uses native C# objects that are dynamically mapped to a full, custom database engine (not just a key-value store). This allows us to provide a simple API while even enhancing performance. With Realm, you can model complex data, link objects in a graph, and compose advanced queries. You can see more examples of how to use these APIs in our sample apps. Realm’s ease of use doesn’t come at a performance cost. 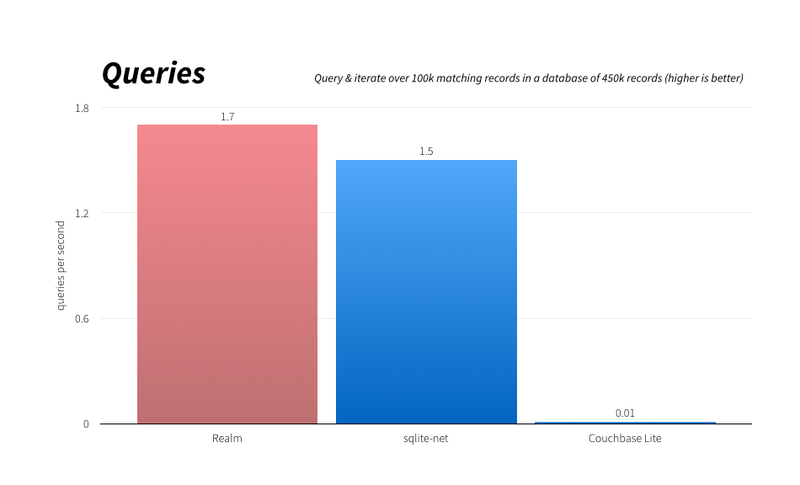 Because of its memory mapping, lazy loading, and custom storage engine, Realm is usually faster than SQLite despite offering a rich object-based API. Although we always recommend everyone test their own use-cases, we usually see huge speedups when porting code to Realm. See benchmark results below. This should go without saying, but Realm Xamarin obviously allows you to write your app once in C# and target both iOS & Android. Please note the Realm file format is also completely cross-platform, allowing data to be shared across iOS & Android easily. For debugging, .realm files can be opened via the Realm Browser. Realm objects are always up-to-date with the underlying data, making it trivial to follow reactive patterns or a unidirectional data flow. You can link Realm objects in graphs, query any property combination via LINQ, and even easily integrate Realm data in Xamarin.Forms. Realm Xamarin is built on top of the same core as Realm Java, Objective‑C, React Native, and Swift, which is trusted by hundreds of millions of people around the world, and used by e‑commerce applications, banks, healthcare providers, and even governments. Realm Xamarin is built in the open on GitHub. Features are prioritized based on user requests and we welcome contributions. Realm prioritizes support & bugfixes above all else. You can get answers about your database directly from the people that build & maintain it, via Stack Overflow, GitHub or Twitter. 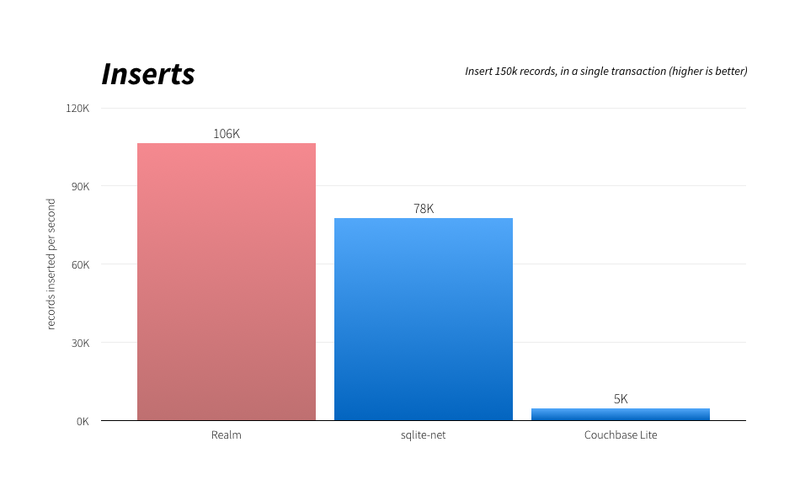 Tests conducted on May 9, 2016, using the latest versions available of Realm, sqlite-net and Couchbase Lite. Measurements taken on an iPhone 6S Plus with 128GB memory running iOS 9.3.1. Source. We recommend you perform your own benchmarks that represents your use cases as any synthetic benchmarks can only provide rough indicators. We’d love your feedback on what we can improve, and we’re particularly interested in bug reports or feature requests on our GitHub repository. Expect the API to improve significantly over the next few weeks, especially as we polish advanced features like migrations and queries. If you are a fan of .NET and want UWP support or Unity support, please speak up — we’d love to add that in the future.